I used to tease someone because he got irrationally angry about stickers on fruit. He wasn’t daft enough to consume them accidentally, he just resented the placement of them. There was so much more to get cross about, I reasoned. How could he get so upset about labels on fruit, in a world of poverty and injustice and the Daily Express? Today I had my own moment of packaging rage. I found myself railing against Blockbuster for putting a price sticker on my shiny new Quantum of Solace DVD. The DVD wasn’t shrink-wrapped in cellophane, so the sticker was glued onto the front slipcover. Appropriately enough, it was a near-unbreakable bond. Despite my best efforts, one part of the label was left on the box and the other half removed the surface of the slipcase. We take good packaging for granted, and only notice when they don’t work with the ease to which we’ve become accustomed. Drinks cans no longer have tear-off ring-pulls that litter or maim. CDs have tear-strips at the bottom to spare your fingernails and temper. You don’t have to lick stamps any more. So perhaps I’ve come to expect things like those “3 for 2” labels in Waterstones to detach easily. The “out of the box” experience for consumer goods starts when you pick up the item in the shop, and continues throughout the time you carry it home in keen anticipation, unwrap it with eager fingers, and sniff the contents. Maybe the sniffing bit is just me. I may be saying too much now. Still, there are more important things to get irate about than a torn slipcase. Imagine how cross I’d have been if I were one of those collectors who never wants to remove his special edition Future Sonic Screwdriver from its packaging because that would slash its collectable value. Having kids soon cures you of that. My younger son got one of those for his birthday, tore it from its packaging, and played with it so much that he lost the fiddly bit that conceals the hidden “neural relay”. He was entirely phlegmatic about this loss, and still loves the toy. So I shall try to remember that when I am enjoying Quantum of Solace — keep my eyes on the screen, not on the slipcase. Watson: I say, Holmes, what’s that plant over there with all the yellow fruit? Holmes: A lemon tree, my dear Watson. Congratulations to Andy Lane, who has been commissioned by Macmillan Children’s Books to write a three-book series of teen Sherlock Holmes novels. They will take Holmes from a 14-year-old schoolboy to a university student, and reveal how he develops his famous deductive skills. World rights for the titles were obtained by Macmillan from Robert Kirby of United Agents, who was representing both the author and the Estate of Sir Arthur Conan Doyle separately. 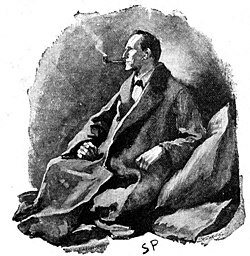 The first case will be one that Conan Doyle referred to but never related: The Colossal Schemes of Baron Maupertuis, in which Holmes uncovers a series of murders during his stay with eccentric relatives in Surrey after his soldier father is unexpectedly posted to India. The first novel will appear in Spring 2010. There’ll be further information at the Bologna Children’s Book Fair next week. Four articles in the latest Doctor Who Magazine made me perk up this week. David Tennant’s interview about Red Nose Day 2009. David Darlington’s preview of The Chaos Pool. Nick Pegg’s celebration of the late John Scott-Martin, the “Chief Dalek” for many years. Andrew Pixley’s article about how Terry Nation shopped his idea for a Dalek series around American TV companies in the mid-Sixties. Terry Nation’s agent was Beryl Vertue. Beryl’s daughter Sue has been a producer of Comic Relief. Sue’s husband Steven Moffat is the new Executive Producer of Doctor Who. My latest Doctor Who tie-in is published this month. Two decades ago, I and some friends wrote a version of that “Terry Nation’s Daleks” pilot script, and passed it off as real at a convention. This convention was back in the days when the original Doctor Who series was still running (occasionally limping) on BBC1. A crowd of fans would make an annual pilgrimage to Blackpool, because there was a Doctor Who Exhibition on the Golden Mile. It was in a gloomy basement, where you could see props and costumes from the TV series, some of them still recognisable beneath an over-generous dollop of fluorescent paint (or fluoripsent paint, as we fans like to call it for cryptic reasons of our own). A group of fans would book out the Lyric Hotel, a family-run boarding house on the front. And there would be a whole weekend of drinking, Doctor Who, and dalliance. You can guess which two were the most popular of those three activities (clue: we were Doctor Who fans), so if several people crammed into someone’s bedroom late at night, it was probably only for a dramatised reading of a Doctor Who script. We knew how to have a good time, oh yes indeed. Shut up. During the afternoons, more people than Health & Safety regulations should strictly have allowed would cram into the hotel dining room, where a makeshift pyramid of chairs on a table would precariously support a TV set on which bootleg recordings of old shows and the occasional compilation of clips would be replayed to a rapt and rather sweaty congregation. This was in Ye Olden Dayes before your shiny DVDs and your BBC3 repeats and your BBC iPlayer, and many of us were therefore pathetically grateful to see a fifth-generation VHS recording of Doctor Who and the Silurians for the first time in over a decade. Some others, however, would stand at the back of the room and cluck disparagingly at the quality of the tape, because they obviously had a much better version back at home. Plus a number of rarer episodes that they weren’t going to let anyone have in a hurry. It became fashionable to run a “rumour sweep”. Each year in Blackpool, a story more implausible than the previous year’s was circulated and, as is the way of these things, passed beyond Fantasy and into Truth. These included news of the Season 18 opener “Curse of Mandragora” and later “The Six Doctors”, each an elegantly documented forgery of BBC scripts in progress. Since it was a feature of the Blackpool Weekend to do “performances” of transmitted DW scripts (from copies of the BBC’s scripts), the opportunity to do group “performances” of as-yet unscreened scripts was too much to resist. Which prompted an evil thought in the minds of some people who, in any kind of sane world, would be told to Get A Life… So one year, a battered copy of episode 2 of Terry Nation’s unsuccessful US Dalek series appeared. This masterpiece was written by many hands, including Andy Lane, Justin Richards, Craig Hinton, Andrew Martin, and me. Justin had produced the outline and sent us our assignments. I was living in Glasgow at the time, so I dutifully wrote my section and posted it back to him. Justin rekeyed the entire thing on a crappy old typewriter (i.e. his own typewriter), photocopied it, bound it, sprinkled it with a watering can, and threw it into a tumble-drier for 15 minutes. It looked the business. To make the script itself more plausible, it was based around all the usual Terry Nation cliches — a Dead Planet with a Petrified Forest and a Square-Jawed Hero Called Tarrant, for example. And to make it more fun to write, each author had a list of Terry Nation’s Doctor Who stories (full stories or episode titles) that we had to incorporate in a cunning way. There were three separate characters called John, Scott, and Martin in honour of the Chief Dalek. And if that wasn’t enough fun, we added in Terry Nation’s Blake’s 7 episode titles as well. So, “Inferno” would be an example of an easy one, as was “Volcano”, and even “Death to the Daleks” could be worked into the dialogue without too much pain. We had to be more creative with “The Android Invasion” and “Orac”, mind you. The most challenging story title, however, was handled with aplomb by my late friend Craig Hinton. His section of script featured the horrible owse creature from the planet Kaesoff. There were two types: one lived on land, and the other was a water dweller. “The Kaesoff land owse,” said one character, “was bad enough, but I’d hate to meet the Kaesoff marine owse…” How we chortled to ourselves. Some people twigged it was a con during the reading. And one person did recognise that the scribbles on the front cover might have been dictated by David Whitaker in the 1960s, but only if his secretary had handwriting exactly like Justin Richards. Nevertheless, some people still went away with the impression it was real and we, smug young upstarts that we were, returned home to our empty lives with the satisfaction of a Job Well Done. Indeed, one of our colleagues even wrote an article about it for TV Zone, but we thought it would be cruel to let him publish it without knowing The Truth. I can’t remember whether he was more upset that we’d taken him in, or that he wasn’t going to get 2p a word for the article that he subsequently spiked. If this blog post has made you smile, why not make a donation to the Red Nose appeal, as advertised in the magazine that prompted this blog post? And if you haven’t smiled, then make a donation anyway, you miserable sod.